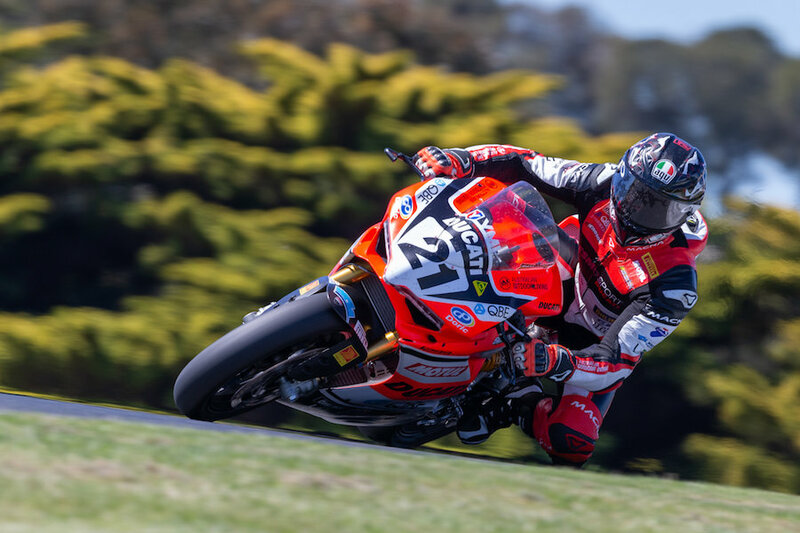 Troy Bayliss (Desmosport Ducati, 1299 Panigale) has taken the overall round here at the Spokes.com.au presents Round 7 Phillip Island Grand Prix Circuit in exceptional circumstances. A victory in Race Two sealing the overall victory for the Desmosport Ducati rider. 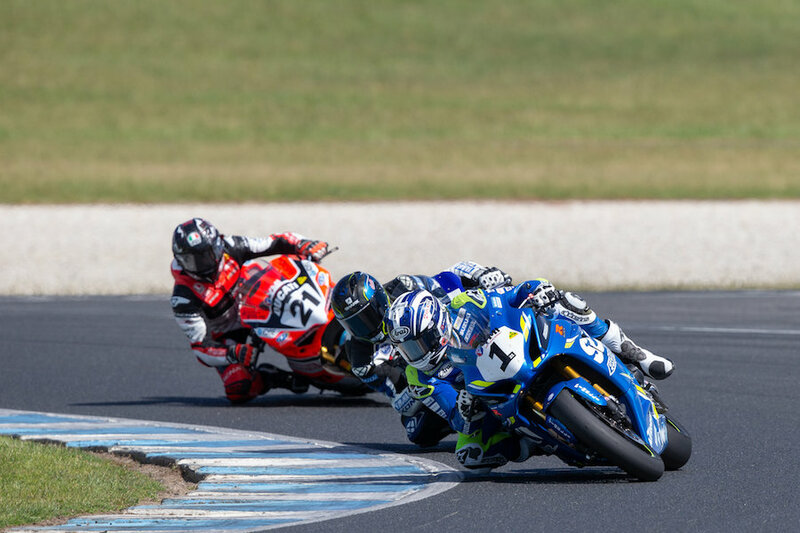 Also sharing the winning spoils was Josh Waters (Team Suzuki ECSTAR, GSX-R1000R) at the last round of the 2018 Yamaha Motor Finance Australian Superbike Championship presented by Motul Pirelli (ASBK) season. Josh Waters (Team Suzuki ECSTAR, GSX-R1000R) is back on the winner’s board for 2018 after taking out a race for the ages. 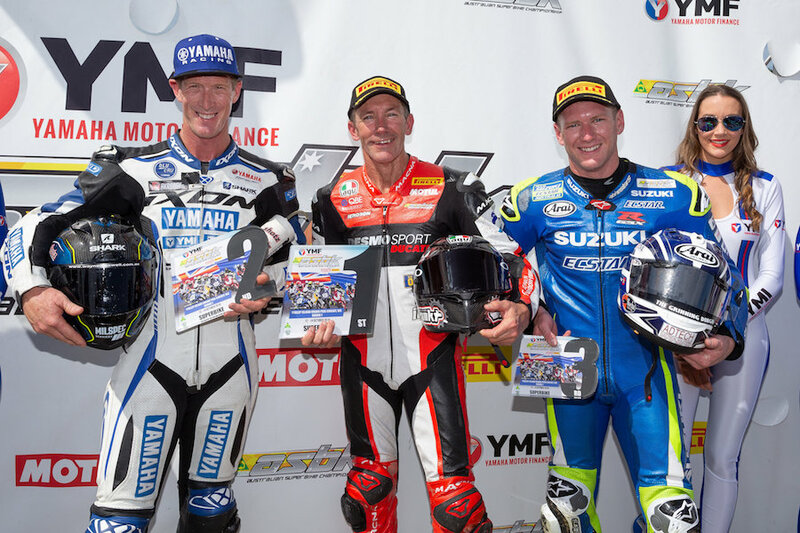 In a duel that would have Superbike fans off their feet, Waters, Wayne Maxwell (Yamaha Racing Team, YZF-R1M) and Troy Bayliss (Desmosport Ducati, 1299 Panigale Final Edition) would duke it out for victory. The 12-lap race was full of twists and turns as Waters took the lead at the start, followed by Maxwell and Bryan Staring (Kawasaki BCperformance, ZX-10R). Unfortunately Staring went backwards on lap two, having an issue with his quick shifter, that allowed Bayliss to move into third. As Waters and Maxwell were battling it out in front, Bayliss was closing in with phenomenal pace on the top two. Eventually he would catch them and what ensued was a battle for the ages. By the mid-stages of the race, the top three were miles in front and looking stronger than the rest of the field. Maxwell made his move into the lead on lap seven and Bayliss had a massive moment, his Desmosport Ducati bucking and weaving everywhere. Bayliss made his move on lap nine and took the lead into turn one, his 1299 Panigale delivering him the power he needed and it looked like he was in the box seat to take the win, leading on the final lap. Waters would strike back and take the lead on the final lap to take a victory to remember! Maxwell passed Bayliss at Lukey Heights to take second and Bayliss took third place. Finishing in fourth was Glenn Allerton (NextGen Motorsports, BMW S1000 RR) with a fantastic return race. Daniel Falzon finished in fifth (Yamaha Racing Team, YZF-R1). The 2018 YMI Superbike Champion, Troy Herfoss (Penrite Honda Racing, Honda CBR1000SP) in sixth and Ted Collins (NextGen Motorsports, BMW S1000RR) finished in seventh with another great performance. Bayliss has taken a win to remember here at Phillip Island after a race with plenty of twists and turns. The win marking a very successful season for the Ducati rider, who also managed to secure third place in the championship. Expectations were at a high after an incredible race one for YMI Superbike, luckily race two managed to deliver in spades. This time Maxwell would lead into turn one, followed by Staring, Bayliss, Falzon and Waters. It appeared that the top three were making a significant gap to the chasing pack and they would be the ones to contend for victory. The pack managed to bunch up again however and a very competitive top four was forming as Bayliss, Staring, Waters and Maxwell battled it out. Interestingly the lap times were slower than race one, but the battles between the top four were nothing less than exciting. All of the riders were desperate to take the final win of the 2018 season. The final lap was full of drama with Bayliss leading as they crossed the start finish straight, Waters made a daring move and took the lead, but crashed at the end of Lukey Heights. Bayliss then sailed past to take victory, in front of Staring in second and Maxwell in third. 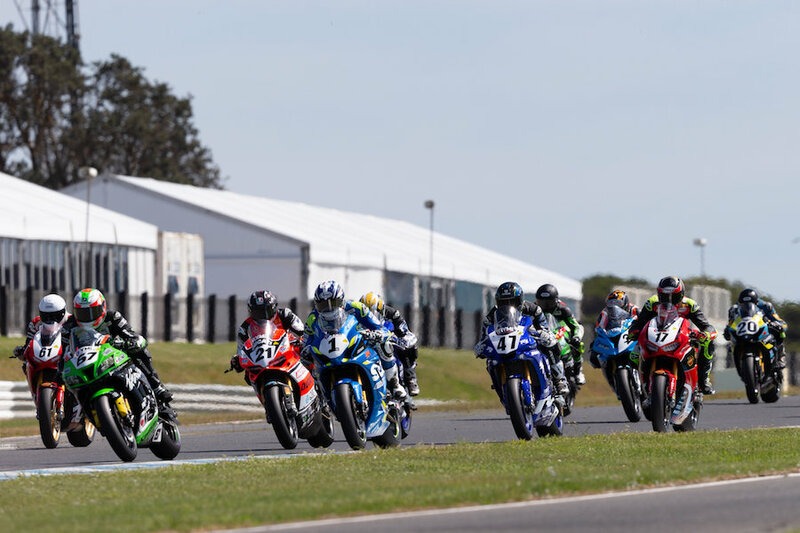 Ted Collins (NextGen Motorsports, BMW S1000RR) achieved his best result yet taking out fourth place for a very competitive round and Matt Walters (Swann Insurance, Kawasaki ZX-10R) took fifth. The final championship standings have Troy Herfoss as the YMI Superbike Champion with 321.5 points ahead of Maxwell who secured second with 276 points and Bayliss finished third with 273 points.